Add comfort to your dining room with this practical and transitionally styled dining set from CorLiving. This set includes four chairs with Grey Stone leatherette seats and a table constructed of hardwood and wood composites. Features a Rich Cappuccino finish that will compliment any decor setting. This quality product offers great value and assembles with ease. Add some sophistication and class to your dining space with this classically styled 5pc table and chair set from CorLiving. The easy to clean padded seat is offered in high gloss dark brown bonded leather. Detailed fretwork, curved legs and warm wood tones add a touch of refinement to your dining area. The table top is decorated with elegant real wood veneer inlay and a beveled edge. High strength steel frames and hidden plastic floor protectors will not harm your hardwood or laminate floors while providing a sturdy base. Your guests will be sure to admire the classic design and luxurious comfort of this charming 5pc table and chair set! Our Cosco Outdoor Living 7 piece Blue Veil brushed aluminum patio furniture dining set with cushions is reminiscent of a carefree and relaxing paradise. This 7 Piece Dining Set includes six slat-backed chairs with a plush removable seat cushion. The ample lightweight slat-topped dining table will easily hold almost anything you put on it. For extra support and durability, the set is constructed with a powder-coated aluminum frame in light gray. It features an artisan hand-painted wood grain finish. 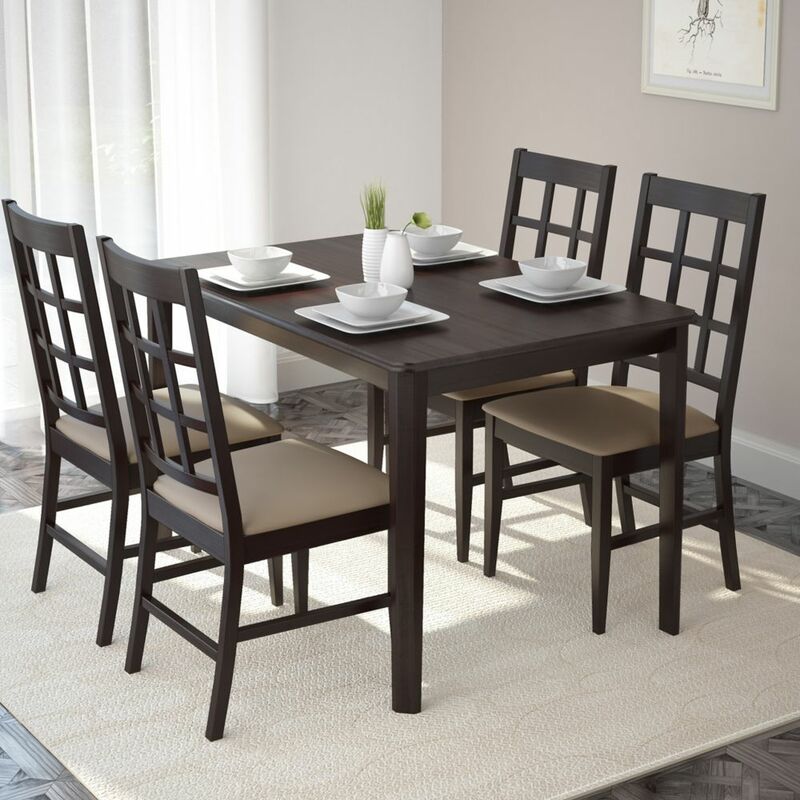 DRG-695-Z Atwood 5pc Dining Set, with Grey Stone Leatherette Seats Add comfort to your dining room with this practical and transitionally styled dining set from CorLiving. This set includes four chairs with Grey Stone leatherette seats and a table constructed of hardwood and wood composites. Features a Rich Cappuccino finish that will compliment any decor setting. This quality product offers great value and assembles with ease.